Milk Production: Milk production in the 23 major states during June totaled 17.2 billion pounds, up 1.3% from June 2017. Production per cow for June averaged 1,964 pounds. 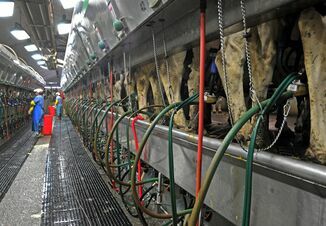 The number of milk cows was 8.75 million head, unchanged from May 2018. May production was revised up 0.2% to 18.0 billion pounds. 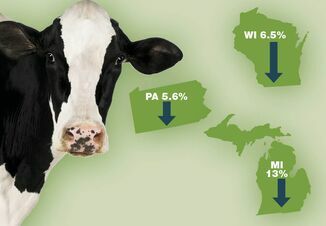 For milk production in the top 5 producing states, California was up 0.5% from June a year ago; Wisconsin up 1.2%; Idaho up 1.0%; New York up 1.4%; and Texas up 6.6%. Other states with large production increases were Colorado (10.7%), Kansas (7.4%), Utah (6.3%), and South Dakota (4.1%). The states reporting a large decline in production compared to June 2017 were Florida (-3.7%) and Virginia (-2.8%). Milk Price and Utilization: The Southeast Uniform milk price for June was $18.12, up $0.66 from May and $0.58 lower than June 2017. The Appalachian Uniform milk price was $17.81, up $0.61 from May and $0.56 lower than June 2017. June’s Class III price was $15.21, up $0.03 from May, and $1.23 lower than June a year ago. The Class IV price was up $0.34 from May to $14.91, and $0.98 lower than June 2017. The Class I Mover price for August is $14.15, down $1.21 from July. The milk/feed ratio for June was 1.98, up 0.08 from May. Southeast Class I utilization was 67.83%, up 0.08% from May, and 1.58% higher than June a year ago. The Uniform butterfat price was $2.6597, up 7.84 cents from last month and 8.37 cents higher than June 2017. The June Class I price was $19.05. July Class I price is $19.16. Appalachian Class I utilization was 67.00%, down 0.75% from May, and 3.44% higher than June a year ago. The Uniform butterfat price was $2.6607, up 7.62 cents from last month and 7.24 cents higher than June 2017. The June Class I price was $18.65. Cheese Production and Stocks: Total cheese production in May was 1.09 billion pounds, up 1.4% from a year ago while butter production was up 2.8% to 168 million pounds. Nonfat dry milk (NDM) production was down 4.5% compared to a year ago with total production at 160 million pounds while skim milk powder (SMP) production was down 1.3% to 50.4 million pounds compared to a year ago. Total cheese stocks at the end of June were up 6% from June a year ago and up 1% from the previous month while butter stocks were down 1% from last month and up 8% from a year ago. Springer Prices and Cow Slaughter: At Smiths Grove, Kentucky on July 24, supreme springers were not tested while US approved springers were $1,175 to $1,225 per head, down $25 from the previous month. Dairy cow slaughter in June was 237,500 head, down 7,600 head from May and 800 more than June 2017. 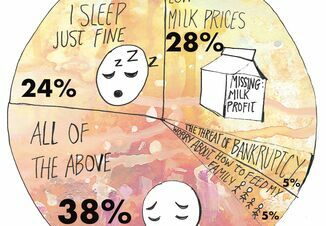 What is the Market Offering for Milk to be Sold in October? Ex: It is Jul. 31 and Oct. Class III milk futures are trading at $16.20. Local Oct. basis estimate is +$3.00. Ex: It is Jul. 31 and Nov. Class III milk futures are trading at $16.06. Local Nov. basis estimate is +$3.00.